One of the reasons I was excited to play with the Pi was the rank of pins on one of its corners, the ‘low-level peripheral‘ pin-out. GPIO pins, SPI, I2C and even an onboard 3.3v serial connection (UART)! 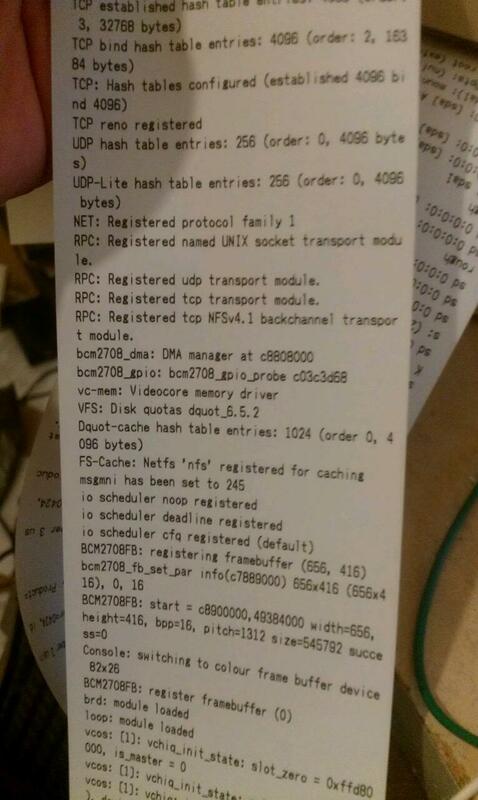 In fact, in the stock debian image, it is configured to output the bootup messages and the kernel errors to this port! But it’s not just for that. Oh no. You can play with it too! The serial device is at ‘/dev/ttyAMA0’ and by default, outputs kernel messages at 115200 baud. This is configured in /boot/cmdline.txt and you can remove the option, or alter the connection speed it outputs at. If you were going to use this port for your own purposes, I would recommend you disable the kernel logging for obvious reasons! The “console” and “kgdboc” options that include “ttyAMA0” are the ones that are important here. You see the pins marked 5v and the 3v3? 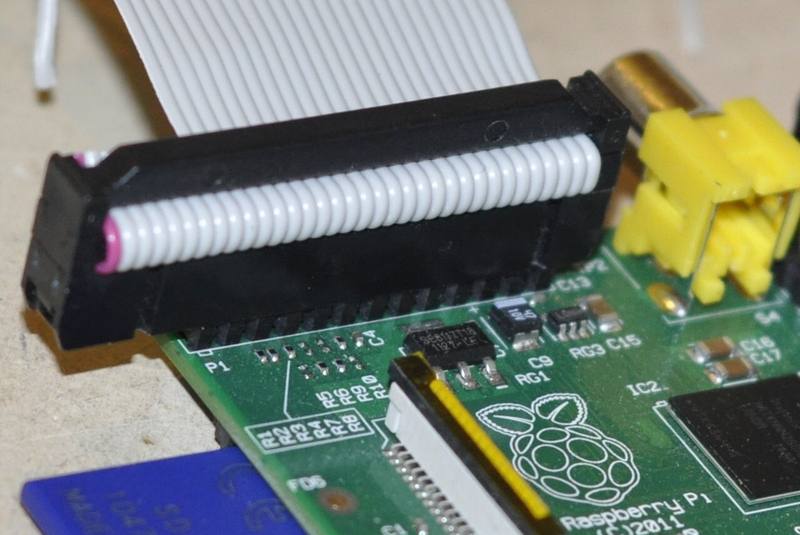 You should never let them connect or you might do something nasty to your Pi! And the one below the 5v? That is marked as ‘Do Not Connect’ so you shouldn’t really connect anything to that either. This isn’t really an interface that you should be poking wires at by hand, or even using crocodile clips. You need a connector that can clip onto this and lets you pick and choose your connections easily. There are some breakout boards already, such as the Slice Of Pi, or the Gertboard. I used a floppy disc drive connector. It has the same pitch as the pins and you’ll find that you can slip most of the connector onto it nicely. There is a bit of overhang, but don’t worry about that! I used a multimeter to make sure that the wires I was stripping and preparing at one end of the ribbon cable, were the ones I wanted to connect to. In this case the 5v, the 0v (Ground) and the two yellow pins, Tx and Rx. If you have got this far, then this is it! If you have a serial port connector, like an USB FTDI cable, you can connect that to these and start to communicate! 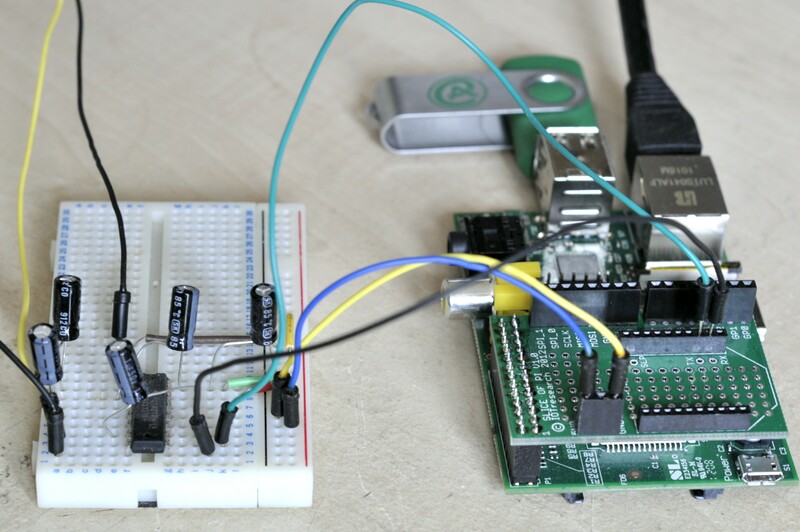 See http://www.irrational.net/2012/04/19/using-the-raspberry-pis-serial-port/ for an excellent write-up on how to use this connection to interface with your Pi. 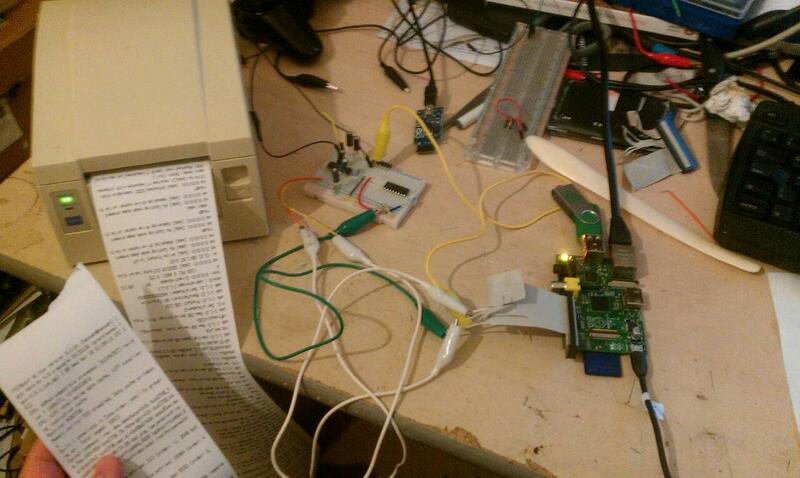 A few years back, I followed in the footsteps of others and hacked about with a receipt printer – a ‘microprinter‘ as they are sometimes referred to. In fact, I even got to the point of being able to push image data to it via an adapted serial connection, the details of which you can find here. I pulled the bag with all the printer bits and pieces off the shelf and begin reconstructing what I had done, rebuilding the circuit that allowed this printer’s TTL serial to chat with the normal RS232 serial using a MAX232N chip. I was saved by my own post, as I couldn’t remember how to do it to save my life! The printer also uses a much slower baud rate (9600) so I lowered that in the cmdline.txt and rebooted with everything connected. An awful lot of what is printed during the boot sequence is output by the kernel during initialization – i.e. during the set-up of devices that are later used to support the operating system implemented on the root filie system. One of the classes of devices that need to be set-up are terminal (tty) devices – so it kind-of follows that the thing being output to during this kernel initialization process isn’t really a tty device. The kernel calls it (well them actually) a ‘console’. The kernel command line allows you to identify and set the baud rate for these consoles and kernel output goes to them all (e.g. 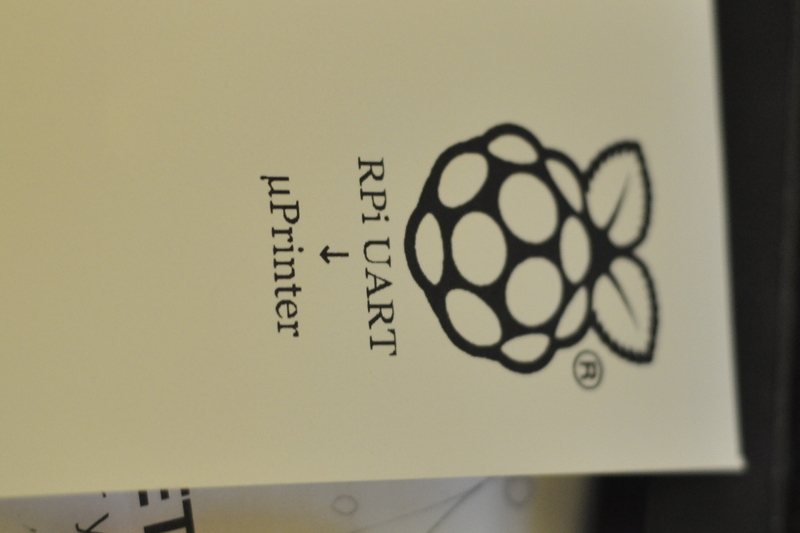 to the HDMI framebuffer console and to the UART console). Each console normally ends up being presented as a separate tty device in /dev. Once the operating system gets hold of the devices the kernel has left it, it configures them and uses them as it sees fit. In our case we do the standard thing of running a shell on just about any tty we can find. This is implemented in the file that controls what we do when control is first passed to the operating system – /etc/inittab. if you want the operating system to run at 9600 baud. I also picked up a Slice of Pi PCB and headers from Ciseco, as my hacky floppy drive connector was not up to scratch for prototyping. It’s meant to be a breakout board and allow for easy addition of an XBee module but I am pretty sure all I will use it for is as a breakout board. Once soldered together, it sat quite nicely over the Pi, but I couldn’t help feel that a supporting leg on one side would be helpful, to avoid stressing the Pi’s GPIO header when plugging in wires to the breakout board. The current supply (5v,3v3, 0v) is collected to one side, but the kit doesn’t include anything to solder in there for ease of use. I cut down a stackable header to size and soldered that in as you will see from the picture, but it would’ve been nice if this was part of the kit too. Cool, I’d love it if you emailed me how you get on with making something like this. I want to try something like this but worry it might be a bit beyond my abilities. I wonder if it could be done with a usb receipt printer? Ouch, not sure how to take that! He’s just depressed that you beat him to it. Awesome work by the way! Nicely done! It’s great to have these inspirational posts for when people are getting their boards. Hi there, great write-up that is accessible to linux n00bs like me. I wonder if you can help me at all further please? I want to attach a serial mouse systems mouse to my Pi. I have a RS232 breakout board, and have swapped a MAX3232CPE chip in to make sure it’s 3V3 friendly. I learned about apt-get and installed inputattach and ldattach. Out of ideas – all of the above was new to me!!! Can you offer any pointers please? I think that a number of years ago, ‘inputattach’ would’ve been what you needed to do to get the mouse to show up. However, I think the “new” device detection/etc will not pick that up. You might want to check that as that is from memory… but that alone – I think – would be a way to get the mouse to show up in X11. You will have to restart X if it is already running. A simple question… how are you powering your mouse? Does it expect to get power from DTR/RTS etc at a “reasonable” current? hi!! great work, i just have a question, could i use a regular MAX232 to shift the levels, i mean, the RPi CPU uses 3V3, and a regular/common MAX232 uses 5V of i’m not mistaken, so, can i use any MAX232 or do i have to use the MAX3232CPE that some recommend??? I had some MAX232’s lying around and the datasheet led me to believe that they were somewhat compatible (ie they worked and I wasn’t too scared of killing the Pi) but yes, the MAX3232 are the better line to use 🙂 It’s pin compatible too, so exactly the same circuit will work for both chips. I only mention this seeing a comment also repeating the incorrect device name while trying to setup an Xorg config file, and that one character is all that stands between it working, and haven’t seen a correction or a “I got it working” post since. Hope that helps clear up any confusion. Or perhaps it’s just the font/css used here. Very strangely, when I copy/paste, I get a letter. But in my posting, it shows the same character as elsewhere. If this is just a wordpress issue, feel free to delete both of these posts. Thanks!